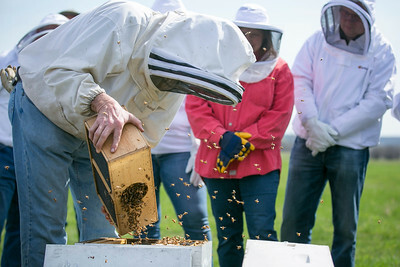 Daryl Quitalig - For Shaw Media Students watch as instructor Larry Krengel finishes installation of a colony by pouring approximately three pounds of bees into a hive during a session of FieldStudy in Beekeeping, a class presented through McHenry CountyCollege, taught in a bee yard in Woodstock Saturday, April 15, 2017. During the course, students received practical, hands-on instruction for installing, manipulating, and inspecting colonies of bees. 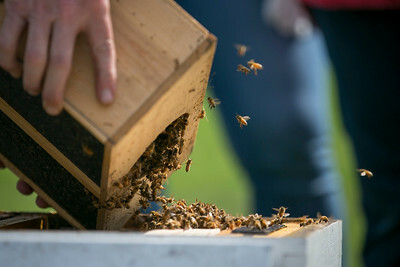 Daryl Quitalig - For Shaw Media Instructor Larry Krengel finishes installation of a colony by pouring approximately three pounds of bees into a hive during a session of FieldStudy in Beekeeping, a class presented through McHenry CountyCollege, taught in a bee yard in Woodstock Saturday, April 15, 2017. During the course, students received practical, hands-on instruction for installing, manipulating, and inspecting colonies of bees. 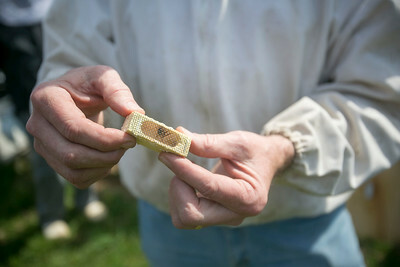 Daryl Quitalig - For Shaw Media Instructor Larry Krengel shows a queen bee still in containment from its purchase during a session of FieldStudy in Beekeeping, a class presented through McHenry CountyCollege, taught in a bee yard in Woodstock Saturday, April 15, 2017. During the course, students received practical, hands-on instruction for installing, manipulating, and inspecting colonies of bees. Daryl Quitalig - For Shaw Media Instructor Larry Krengel sprays a foundation with a sugar water solution in preparation to install a colony during a session of FieldStudy in Beekeeping, a class presented through McHenry CountyCollege, taught in a bee yard in Woodstock Saturday, April 15, 2017. During the course, students received practical, hands-on instruction for installing, manipulating, and inspecting colonies of bees. Daryl Quitalig - For Shaw Media Instructor Larry Krengel demonstrates setting up a smoker during a session of FieldStudy in Beekeeping, a class presented through McHenry CountyCollege, taught in a bee yard in Woodstock Saturday, April 15, 2017. During the course, students received practical, hands-on instruction for installing, manipulating, and inspecting colonies of bees. 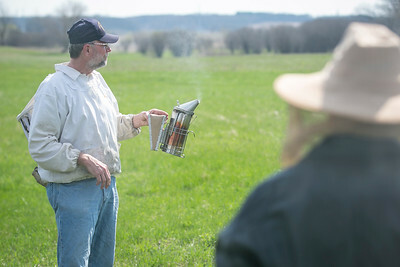 Instructor Larry Krengel demonstrates setting up a smoker during a session of FieldStudy in Beekeeping, a class presented through McHenry CountyCollege, taught in a bee yard in Woodstock Saturday, April 15, 2017. 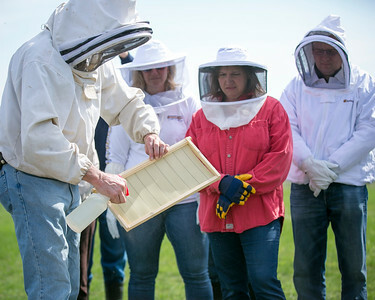 During the course, students received practical, hands-on instruction for installing, manipulating, and inspecting colonies of bees.